Get the full parsed headers for this. Get the length of the data segment for this mime part. Get the mime type associated with this node. Helper method which simplifies parsing the return from type(). Get the number of atachments. Default constructor - creates a useless LLMimeIndex. Add attachment information as a sub-part to a multipart mime. Skeletal information useful for handling mime packages. An instance of this class is the parsed output from a LLMimeParser which then allows for easy access into a data stream to find and get what you want out of it. This class meant as a tool to quickly find what you seek in a parsed mime entity. As such, it does not have useful support for modification of a mime entity and specializes the interface toward querying data from a fixed mime entity. Modifying an instance of LLMimeIndx does not alter a mime entity and changes to a mime entity itself are not propogated into an instance of a LLMimeIndex. Definition at line 73 of file llmime.h. Definition at line 173 of file llmime.cpp. content_offset The number of bytes to the start of the data segment of this mime entity from the start of the stream or buffer. Definition at line 177 of file llmime.cpp. mime The other mime object. Definition at line 182 of file llmime.cpp. Definition at line 188 of file llmime.cpp. sub_part the part to attach. Returns true on success, false on failure. Definition at line 209 of file llmime.cpp. References LLMimeIndex::Impl::mAttachments, mImpl, and S32_MAX. Returns the content length in bytes. Returns -1 if length is not known. Definition at line 119 of file llmime.cpp. References LLSD::asInteger(), CONTENT_LENGTH(), LLSD::isDefined(), LLMimeIndex::Impl::mHeaders, mImpl, and S32. Definition at line 131 of file llmime.cpp. References LLSD::asString(), CONTENT_TYPE(), LLSD::isDefined(), LLMimeIndex::Impl::mHeaders, mImpl, and type. If there are any headers, it will be a map of header name to the value found on the line. The name is everything before the colon, and the value is the string found after the colon to the end of the line after trimming leading whitespace. So, for example: Content-Type: text/plain would become an entry in the headers of: headers["Content-Type"] == "text/plain"
If this instance of an index was generated by the LLMimeParser::parseIndex() call, all header names in rfc2045 will be capitalized as in rfc, eg Content-Length and MIME-Version, not content-length and mime-version. Returns an LLSD map of header name to value. Returns undef if there are no headers. Definition at line 109 of file llmime.cpp. Returns true if this is a multipart mime, and therefore getting subparts will succeed. Definition at line 142 of file llmime.cpp. References LLSD::asString(), CONTENT_TYPE(), LLSD::isDefined(), LLMimeIndex::Impl::mHeaders, mImpl, MULTIPART(), and type. Returns the number of bytes to the start of the data segment from the start of serialized mime entity. Returns -1 if offset is not known. Definition at line 114 of file llmime.cpp. Definition at line 196 of file llmime.cpp. index Value from 0 to (subPartCount() - 1). Returns the indicated sub-part, or an invalid mime index on failure. Definition at line 163 of file llmime.cpp. References LLMimeIndex::Impl::mAttachments, mImpl, and S32. Returns the number of sub-parts for this. Definition at line 158 of file llmime.cpp. Definition at line 196 of file llmime.h. 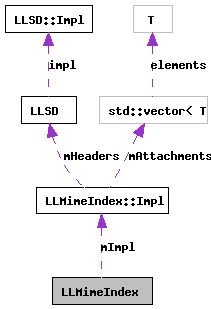 Referenced by attachSubPart(), contentLength(), contentType(), headers(), isMultipart(), LLMimeIndex(), offset(), operator=(), subPart(), subPartCount(), and ~LLMimeIndex().